Oh my. How bad was it? Awful! Didn´t take pics again as it was so bad. With the Open Day tomorrow, and the focal point right next to me, it wouldn´t have been a good idea to have the top beds all covered in weeds, so I got cracking. 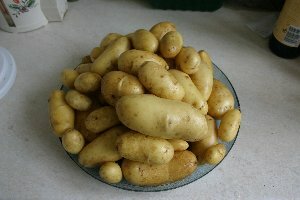 Did the hard bit first - dug over the second earlies bed, and managed to unearth a fine haul of potatoes. I´m very impressed - never had the patience to leave the plants to die back before, and so I grew some whoppers. All in all, I had 6lb 8oz of Charlottes and a monster 10lb 5oz of Kestrels. I planted just eight tubers of each back in the spring. Very pleased. Also dug up a couple of blighty-looking Picasso, with a decent haul from them too. That all had the effect of giving me a couple of tidy beds. Moved on to where the old accidental garlics had been (and some probably still are!). My weeding strategy was basically to get out everything that wasn´t a pot marigold, of which there are hundreds. That bed didn´t take too long (the soft ground meant the grass tufts were easy to pull up) and I tidied the poor runner bean bed too. So much for planting them. I lost all the lovely plants I´d had, thanks to the marauding snails in the back garden. By this point, Chris and Maggie had both appeared. Miracle - I don´t think all three of us have made it up at the same time for years! Nice feeling. Maggie swears she has more weeds than me. I remain unconvinced. Chris fired up the strimmer and pretty much walloped all my plot paths as well as her own. Made a heck of a difference! I continued working my way across the potato beds. The accidental maincrop Sarpo bed (volunteers from last year) has a few small plants gamely growing, so they´ll stay there a few more weeks. Six Picasso are still in (there are still Rattes in there too at the row ends) as are some oops blues and reds from the other volunteer bed (now also cleared up). Lunch was very handily on the Focal Point picnic bench, both Chris and I sitting munching. Marshall has finished the shed with its amazing shelter, and with it being next to mine, it means somewhere I can park a small boy and not worry about the rain or the sun or not being able to see him! Not to mention being able to persuade P to go up, as there´s somewhere he can put a book or two. Back to work, and since it was rather hot by now (so much for 18oC - was more like 23oC) I burrowed into the orchard and picked three huge punnets of redcurrants. They´re incredibly ripe, and the bush has produced thousands. Even the pigeons couldn´t have found them, going by how many were there! Sadly not many blackcurrants this year. Lots of very squashy blackberries too. Don´t think I´ll win any prizes with my apples this time though - bit too small, but got a few for a crumble. Quite sad about the cabbages - should have ignored the rotation and put them into a more open bed given there wasn´t going to be anything else in there. They are a bit shredded and small. Slugs, I expect. Full of speedwell too, but they´ll wait for another day as the nets stop it being so obvious! Back to weeding the obvious beds. Dug up a bucket of shallots, and discovered that despite hoeing between them, there´s loads of teasels grown to enormous size. not any more. Out they came... Bindweed a mare too. Sorted that bed out and the one next to it. The flowerbed is scary. Didn´t go near that, though a lot of its problems are yet more teasels! Must do some serious prep on that one as I intend to turn it into a summer raspberry bed this autumn. Have to decide which canes to get - more Glen Ample or something else. Tulameen are huge but not sure the plants are spineless and I´m a wuss. I´ve already got more spines than I want on the bramble... Glen Moy is an early and Octavia a late. Pity they don´t do half-dozens. Perhaps I should phone and ask. Moved on to the garlic bed and started trying to find the remaining bulbs. They were huge but squelchy, and Chris came to help me sift. Managed to dig over half the bed before it got too late and I had to dash off to pick up the little person. In the meantime, have got a much better-looking plot. I have resigned my Allotment Group membership on grounds that I´d be cross if I were a tenant and saw a Committee member with such a badly-kept plot, I´d think it a bit off. Shame - would have liked to continue, but something had to give and I am not about to give up my plot. I intend to book more days off, as it seems the best way to go at this point as little man is being looked after and I can relax and just get on with it. Hot, sticky and muggy. Perfect blight weather. 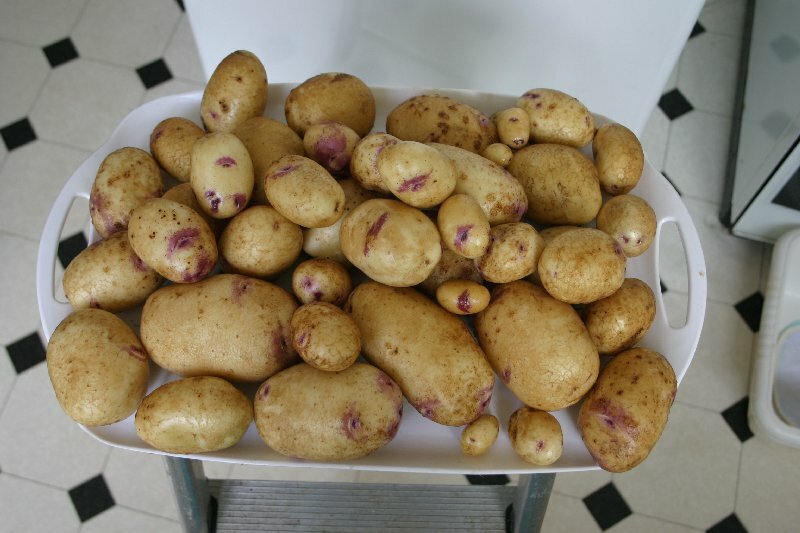 After several full Smith periods recently, I wasn´t surprised to get an email a few days ago from Chris saying the tops of my maincrops looked a bit blighty and that she´d cut them back. Did I want her to dig them up? Well, knowing how many Rattes there would be (there´s usually hundreds of tiny tubers) spurred me on, and with a large chunk of luck (baby asleep on time for once) I was up at the plot at 7.30pm. Already quite dull, so had to work fast. But successfully, despite the lingering wobbly legs from the gastroenteritis I had over the bank holiday. 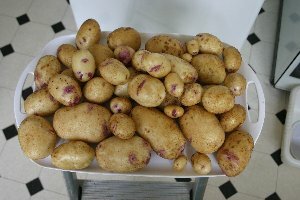 End result: one bucketful of potatoes, mostly enormous to middle-sized Picasso (to add to those I got the other week, so probably have a whole bucketful now) but with the expected dozens of tiny Rattes. Just as it went too dark to see, I chose to try and dig the salad blues... argh. Talk about needing floodlamps! As the light faded I grabbed a few handsful of Bramleys and a teacup-sized minicole cabbage and made it back to the car. Just 8.30pm. Argh - another summer gone already! Back to an email from Yvonne requesting permission to have at the Bramley. Given there´s enough apples on it to sink the Titanic, not a problem! Pics of today´s haul to follow, once I´ve cleaned them up a bit and weighed them. At least this year has been quite good for apples and potatoes - given it´s pretty much all I have!